My very first car, embarrassingly was a white DAF 33. The Daf variomatic 33 was a compact saloon car produced by the DAF company of Eindhoven, in the Netherlands between 1967 and 1974. Outwardly and technically it differed little from its predecessor, the DAF Daffodil.Before the Daffodil was the 750 the original Daf back 1961. By 1966 the DAF 44 appeared to compete in virtually the same market segment as the Daffodil but then the DAF 33 remained in production with its new name. A more luxurious version became available in 1969. Thereafter the car changed very little: however, the 6 volt electrical system was replaced with a 12 volt one in 1972. 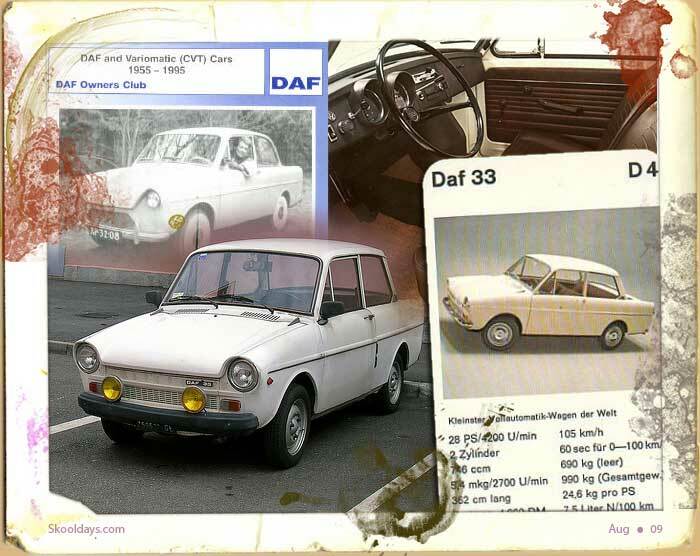 The DAF 33, in common with other DAF cars, featured a continuously variable transmission system, the DAF Variomatic. This entry was posted in Pop Culture and tagged 1960, 1970 by Skooldays. Bookmark the permalink. So was mine! My white 33 was great and I miss it! Although it was over 30 years ago it was a great little car, with loads of character. i did buy another one in the 1990s, which brought tears to my daughter's eyes when I sold it! My dad was a Daf dealer as well as general mechanics and MOTs I grew up with the variomatic (Although my first car was actually a 1959 Moggie). I still say it’s a superior and more efficient transmission to manual or normal automatics. 🙂 Thanks for the trip down memory lane. While stationed in the Netherlands Nato Headquarters Allied Forces Central Unit 1987-1991, I purchased my Daf 33 1966. Best buy in my life….bought for 400 Dutch Guilders ($200.00) and when I transferred sold it for 3,000 Dutch Guilders ($1,500.00)….I cried like a baby, wanted to bring it back with me to the USA….anyway it was a car very dear to my heart.